It's hardly news that Twitter consider music to be one of the more more popular aspects of their service. 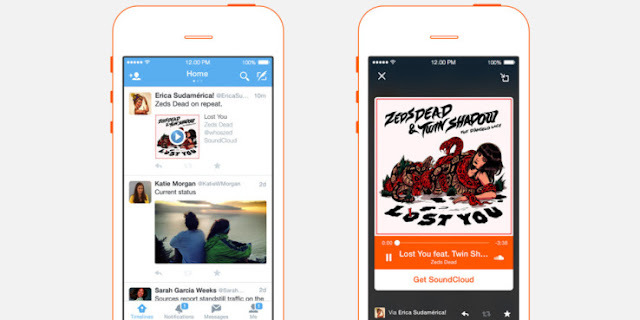 Users love following musicians and in the past artists have tweeted links to free downloads of tracks. The last time Twitter tried to integrate music streaming into their platform they released a separate music app that flopped. This time Twitter are working with Soundcloud to provide tweetable playlists for users. These tweetable playlists are curated like any other Twitter Moment by editors of other media sites. They can pull together tweets that have Soundcloud tracks embedded into them and make them into a playlist. You can tweet the Moment and send people a link to the playlist so you can share music and encourage social interaction. What would make these social interactions better and more practical would be if users could make the playlists themselves, but for now that isn't possible. The playlists are viewable on both desktop and mobile but will be displayed differently. If you look up the playlists on the desktop then you'll see a long page with all the tweets on that you can scroll through. If you want to listen to the songs you have to click play on each individual track. However if you look up the playlists on the app then you can see the work they've done on integrating this. The playlist opens up full screen with the first image and the info and from there you can press play and swipe through the tracks. It makes it a lot easier to go through the music and it's pretty neat. You can only listen to the playlist if you have Twitter open though, but I suppose it's no different to YouTube in that aspect. This whole playlist update is cool but what does let it down is the fact that only editors can make playlists. There really is an opening now for a good playlist building app with 8Tracks being almost useless outside of the US and Noted still being practically an unknown. The reason Twitter's music app failed was because people didn't want to have to follow artists to receive recommendations. This new attempt wouldn't require you to do so because you would be able to grab music from Soundcloud and tweet your own playlists. Of course this has only just rolled out so maybe they'll open playlists up to users in the future, we just have to wait and see. For now I'd recommend finding a tweeted playlist and giving it a listen on your phone so you can revel in the experience as the playlists are available now.